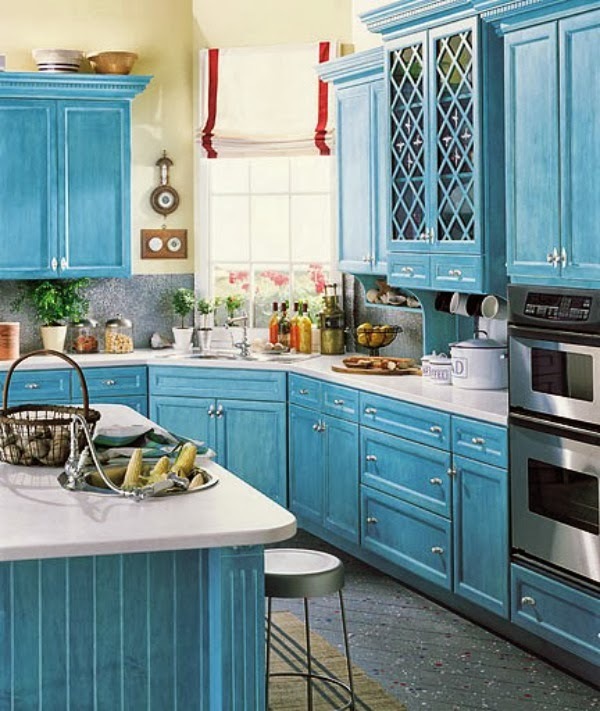 I think I have officially decided that my future home must have a blue kitchen. In any home I feel that the kitchen should be a focal point. The kitchen is where you will create meals for you and others to enjoy. It is where you will be spending time with your friends and relatives as you whip up delicious goodies to snack on. I love to bake and in my future home I want a spacious kitchen with plenty of room to work in. I will need lots of space to try new recipes and to perfect old ones. Around the holidays when we have lots of treats moving out of our kitchen to give to relatives and friends, I need a lot of room to have several things going at the same time. In planning my future kitchen I have already decided lots of storage is a must, so probably a pantry will be needed to store things in as well. A huge refrigerator so that I have plenty of room for keeping cakes, goodies, soup, etc. things that require refrigeration. I would also love a regular stove and oven but also a wall oven so that it is easier to make multiple things at once. And now I have also decided that this kitchen must be blue. What shade of blue? I haven't exactly penned it down yet. At the moment I am leaning more towards lighter shades of blue like robin's egg blue or turquoise, but I am also a fan of royal blue and navy. What are your thoughts? What color is your dream kitchen? blue appliances look super cute! definately a nice twist on the chrome and white appliances you see everywhere. I think I would to white with touches of blue and dark wood floors for sure. Those are all so gorgeous! My dream is for a kitchen that is actually big enough that it contains a pantry....bc my tiny one right now doesn't ;-) I absolutely adore white and bright kitchens with accents colors that blue is really pretty! I love the retro kitchen inspiration in the middle photo, what a great and happy kitchen color! i really love white kitchens but love the pops of blue in the second kitchen! i love big kitchens. really love the retro one. Choosing a kitchen is a huge decision as it has to last a while. Ours is cream so that we can change the look with accessories. Those blue appliances look lovely. 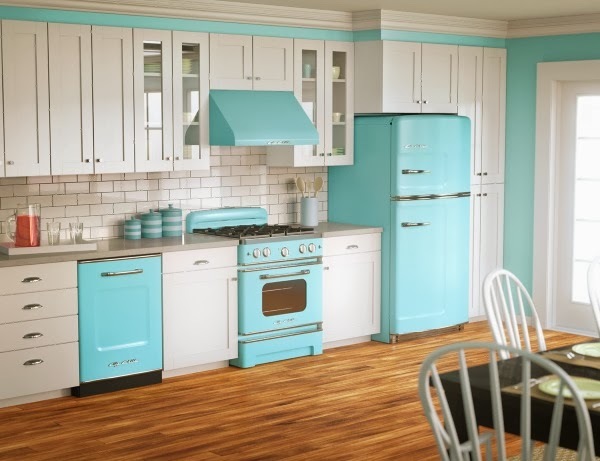 I have always wanted a Tiffany blue kitchen!